This meatless, healthy dinner recipe will satisfy even your hungriest and pickest eaters. These vegetarian Greek Zucchini Meatballs are packed with flavor, and even the texture is perfect. 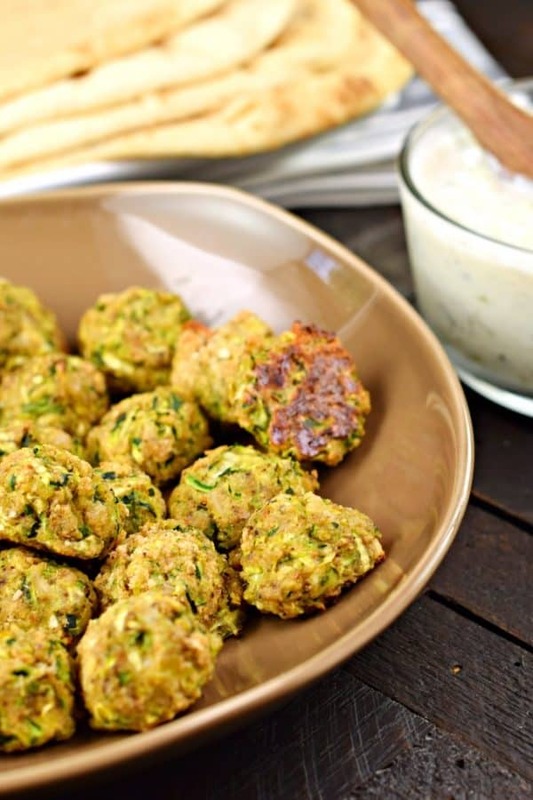 Serve them up with a side of homemade tzatziki sauce and pita bread! Remember that time I made delicious, healthy Zucchini Meatballs? Well I’m back with a new twist! Having gone vegetarian, over four months ago, then giving it up again (I think I just like meat too much, what can I say) I found a new love for meatless meals. Even though I eat meat again (yes it was short lived), I still try to make our family more meatless meals through the week. Those zucchini meatballs were a hit with everyone! We enjoyed them over noodles with spaghetti sauce, and on sub sandwiches! Now, I’ve got a new flavor of meatballs to share. One of my favorite take out indulgences used to be getting a big, fat gyro, complete with tzatziki! My mouth still waters thinking about gyros. 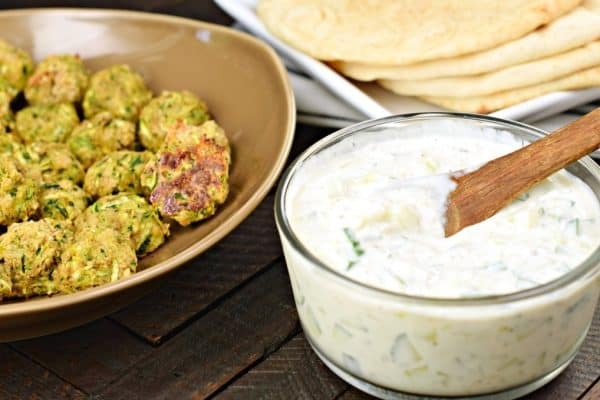 So I gave these meatballs a greek twist, and added a homemade tzatziki sauce! You guys. These are fantastic. Even if you’re NOT vegetarian you’ll enjoy them! And who doesn’t want to eat a little healthier after the holidays? Cook your zucchini first, then press out all the liquid (or as much as possible). I used a mesh strainer, but if you don’t have one, use a clean, thin kitchen towel and place all the cooked zucchini in the center. Twist it up and wring out the liquid! 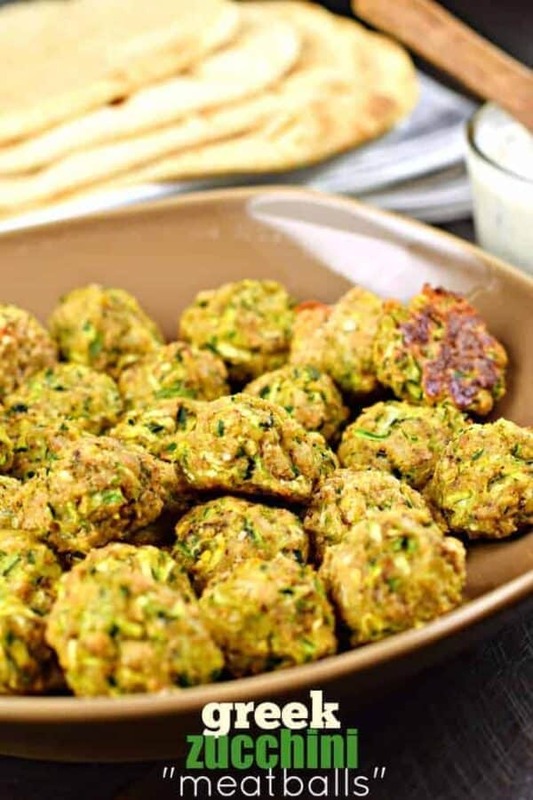 The less liquid the better when it comes to these meatballs! Cavender’s Greek Seasoning is by far my favorite blend. Use YOUR favorite! I use a 2 Tbsp cookie scoop to evenly portion out my “meatballs” so that the cooking time is even as well. Place them on a parchment paper lined baking sheet (or foil lined for easy clean up). Do no skip this part, as these do tend to STICK. I find parchment paper works the best! Or you can use the Reynold’s non-stick foil which is amazing too! Eat immediately. Or freeze them in ziploc gallon freezer bags after cooling. Perfect to make a few batches in late fall when you have TONS of zucchini. 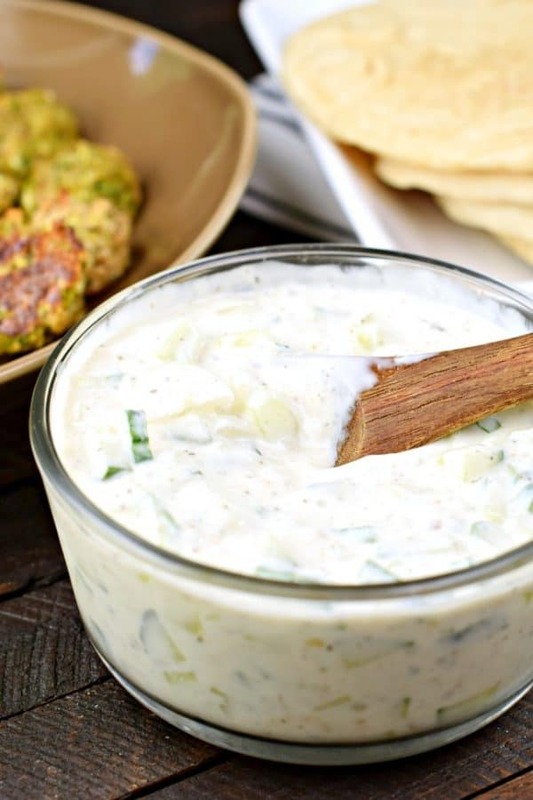 For the tzatziki sauce, try to make it ahead of time. In the morning, the night before, whatever you can. The longer the flavors mingle, the better it tastes. No time for that? It’s okay, it will still be amazing. Make sure you dice your onion and cucumber SMALL. Have you tried making homemade hummus yet? 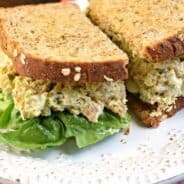 This LEMON Hummus sounds bizarre but it’s my FAVORITE flavor, hands down! This Greek Rice from A Family Feast is seriously on my menu for the week. Doesn’t it look amazing? I’ve also got this American Greek Salad from Kalyn’s Kitchen on the menu (for the same night). LOVE how easy it is to make. And finally, for the main dish, we’ll be having this Greek Lemon Chicken Skewers from Foodie Crush. Although my recipe for Greek Chicken Skewers is also amazing with the avocado tzatziki. Which would you choose?? Prepare the tzatziki sauce first, ahead of time. I prefer to make my sauce in morning, and allowing it to sit in the fridge all day until dinner. The longer time it has to sit, the better the flavor. But don't worry, if you forgot to make it ahead of time, it will still taste amazing. For the sauce, combine all the ingredients in a bowl, then cover and refrigerate for 4 hours. Be sure to dice your onions and cucumbers SMALL. Preheat oven to 375°F. Line a baking sheet with non stick foil. Set aside. In a large skillet, drizzle olive oil and heat over medium high heat. Add garlic and saute for about 1 minute. Add in shredded zucchini. Cook for about 5 minutes, until most of the water in the skillet has evaporated. Transfer to a colander and press out remaining liquid. 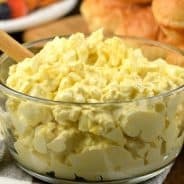 In a large bowl combine bread crumbs, egg, seasonings, and parmesan cheese. Mix with the zucchini until fully blended. Using a 2Tbsp scoop, form 20 balls, rolling tightly, and transfer to prepared baking sheet. Bake for about 20-25 minutes, until firm and lightly browned. 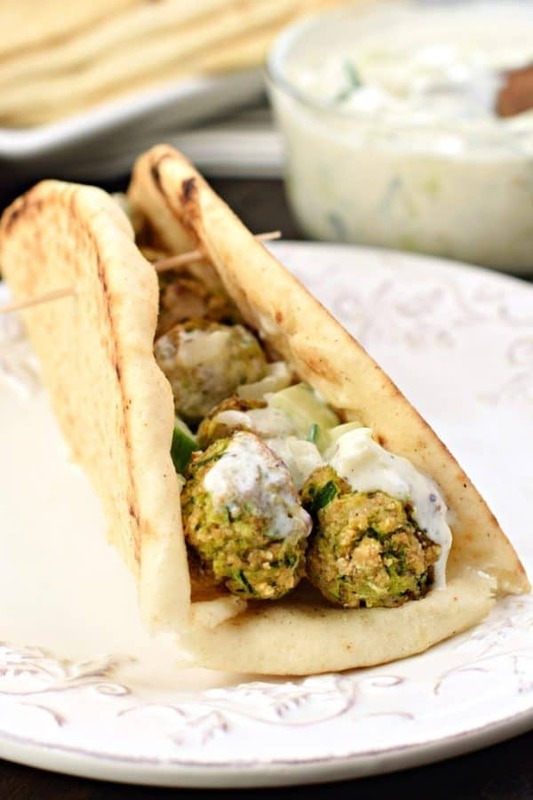 Serve meatballs with tzatziki sauce on a pita! ENJOY! 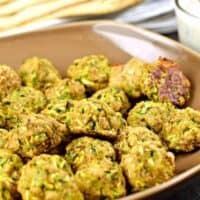 I love the look of those zucchini meatballs. Big fan of Cavenders Greek Seasoning here too. Thanks for the shout-out for my American Greek Salad. I make that often! So YUM – thanks for sharing! 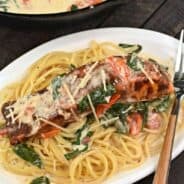 Can these be made the night before and baked just before serving? My only concern would be them getting mushy the longer they sit. I would suggest baking them the night before, then just reheating before you serve 🙂 You can freeze them once baked too, so make them when you have time off, then freeze them until ready to enjoy! I made these and loved them! I made them for the week and they kept really well! With fresh pita and all the fixings, these were absolutely awesome! THank you, they are one our menu for this week again because we love them so much!